They grow up so fast. It seems like only five months ago, that our favorite virtual viewfinder turned 2. Oh wait… it was only five months ago! And 3.0 has already hit the app store? Yup! And it looks like the new version number is fully warranted! This new iteration of Chemical Wedding’s Artemis Directors Viewfinder adds an often requested feature: The ability to add your own cameras to the list of supported gear. 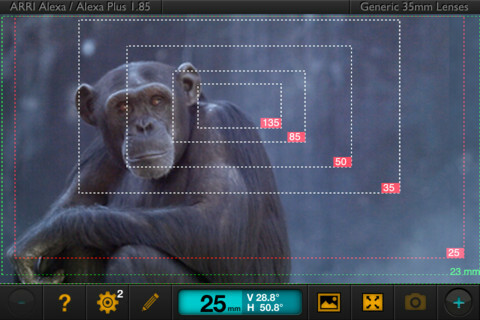 Simply put, if Artemis doesn’t already support your camera, you can take a few simple measurements and add the camera yourself. You can even share your results with the developers, and have your camera added to the official database. It almost makes me want to dig into my attic, and pull out some long forgotten cameras. If you’re not familiar with Artemis, or just want to learn more about director’s viewfinders in general, check out this interview we posted a while back. It was shot at the DV Expo, just prior to the release of version 1, and includes some info about their other app, Helios. Just tried to upgrade to Artemis 3.0 and it loads on my Iphone 3g but when I try to open it. It just crashes. Well that’s a bummer. I’ve been running the update with no problems. Try restarting your phone, and launching the app again. If that doesn’t work, it might be time to contact Chemical Wedding.